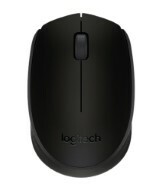 Amazon offering Logitech B170 Black Wireless Mouse Rs. 256 at lowest and best price online.You can follow the below steps to buy this product at their deal price.Keep Visiting dealsheaven.in for more Best offers ,hot online deals, promo code, coupons and discount . Power packed with advanced features along with a modern design, the new Logitech B170 Black Wireless Mouse is all set to amaze you with its outstanding performance. This wireless mouse offers an excellent 10 meters reliable wireless range along with 1000 dpi. You can easily pair it with your system by just plugging in a tiny wireless receiver into the USB slot. This wireless mouse works on the latest 2.4 GHz wireless technology and offers universal compatibility with Windows, Mac OS and Chrome OS.